Do you want evidence that this recipe is good? How about the fact that I’ve been eating it for lunch AND dinner for the past three days straight, and I still wanted a piece for breakfast this morning. Seriously. 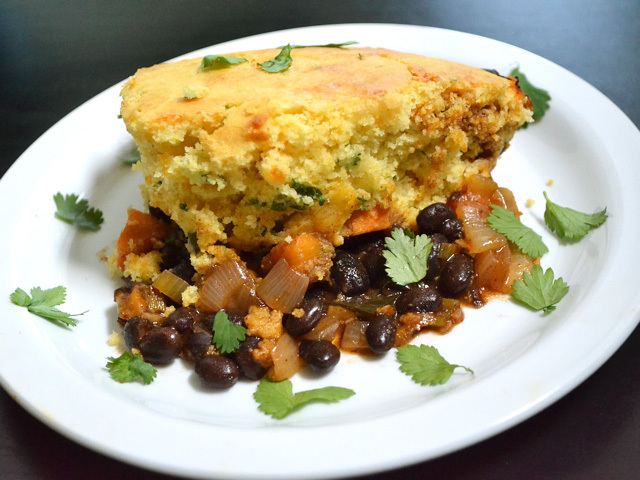 There are a million and two ways to make tamale pie, some being more like actual tamales than others. This one is not so much like a real tamale, but it’s amazing all the same. 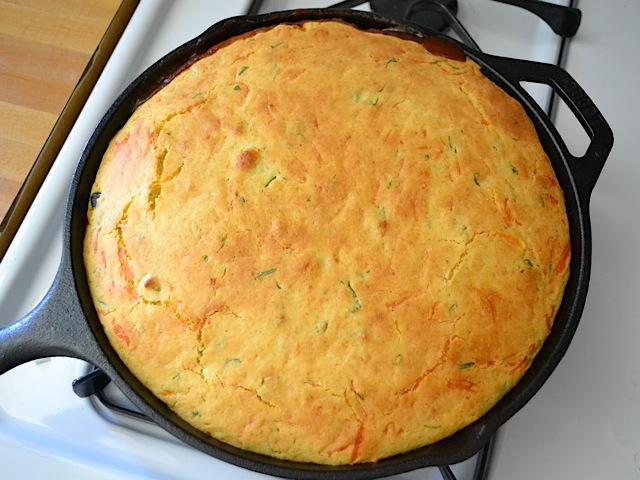 I decided to go with a cornbread crust instead of polenta because A) I’m in love with corn bread and B) I wanted something that could soak up yumminess from the bottom of the pan. It definitely worked. I originally intended to make this a beef tamale pie, but I bullied myself into doing a vegetarian mix because I felt like I needed more beans and vegetables in my life. If you did want to do beef (or chicken or pork), simply switch it out for the sweet potatoes, beans, and peppers… or add them all in there together! It’s very flexible. P.S. I know the ingredients list looks long, but it’s really quite simple to make. Promise! 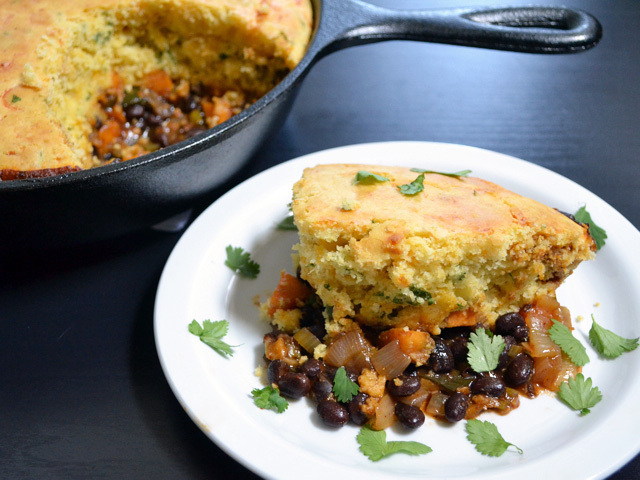 This vegetable tamale pie is super hearty and delicious with a jalapeno cornbread topping. Chop the onion and mince the garlic. Cook in a large skillet with olive oil over medium heat. While onion and garlic are cooking, peel and dice the sweet potato. 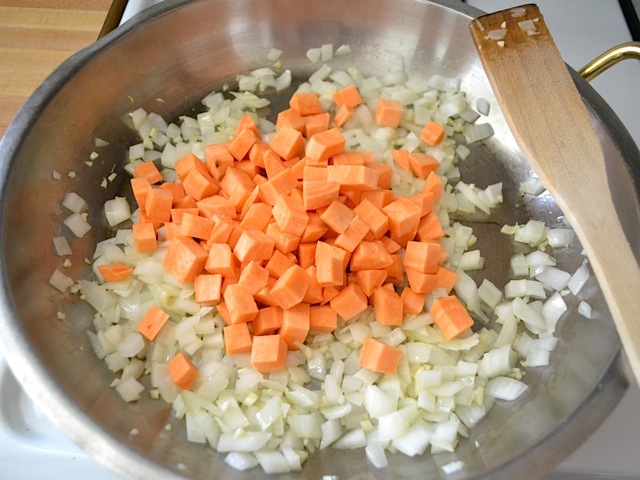 Add the diced sweet potato to the skillet and continue cooking. 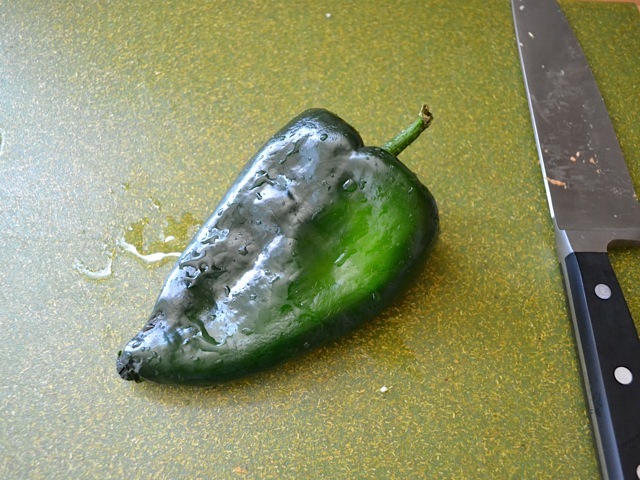 Remove the seeds from the poblano and jalapeno peppers, dice both, and add to the skillet. 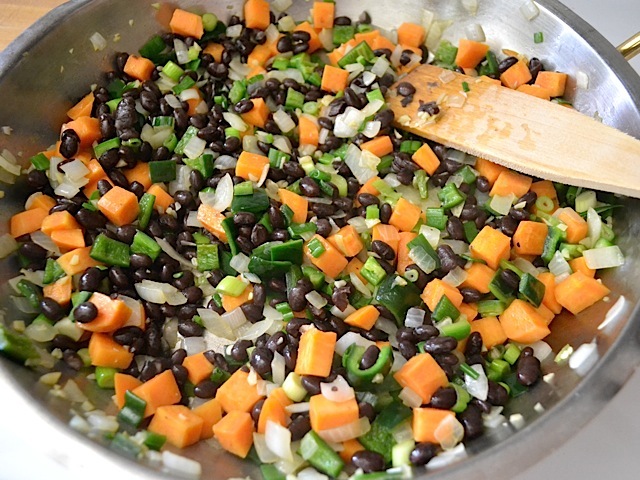 Also add the black beans (drained and rinsed), enchilada sauce, and sliced green onions. Stir and heat through. Taste the mixture and add the chili powder, cumin, and salt. Adjust to your liking. Preheat the oven to 425 degrees. 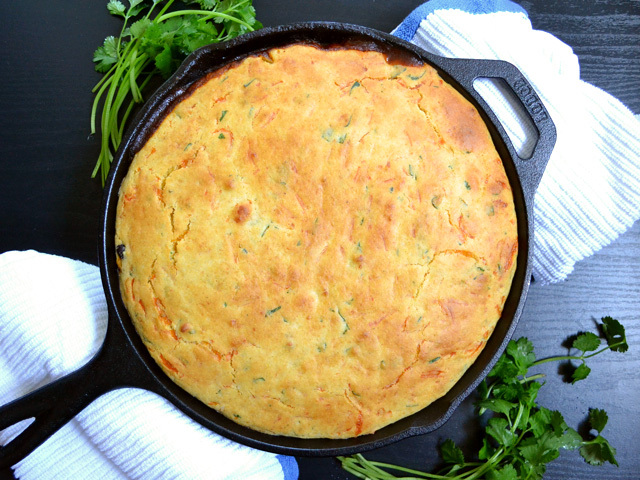 To make the cornbread topping, combine the dry ingredients in a large bowl (flour, cornmeal, sugar, salt, and baking powder). Stir until evenly combined. 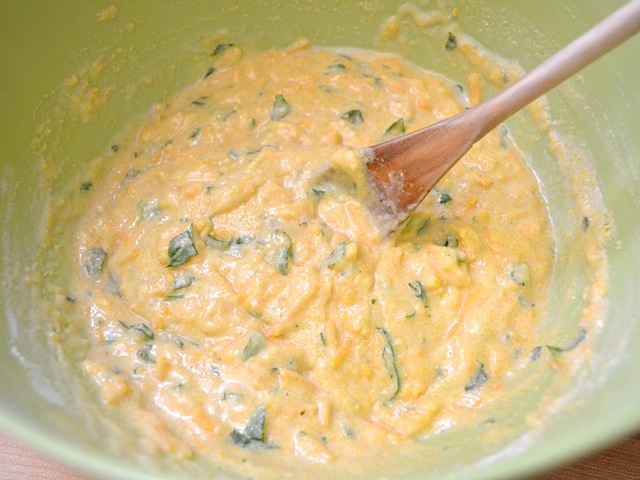 Next, add the wet ingredients (milk, egg, vegetable oil, shredded cheese, and roughly chopped cilantro leaves). 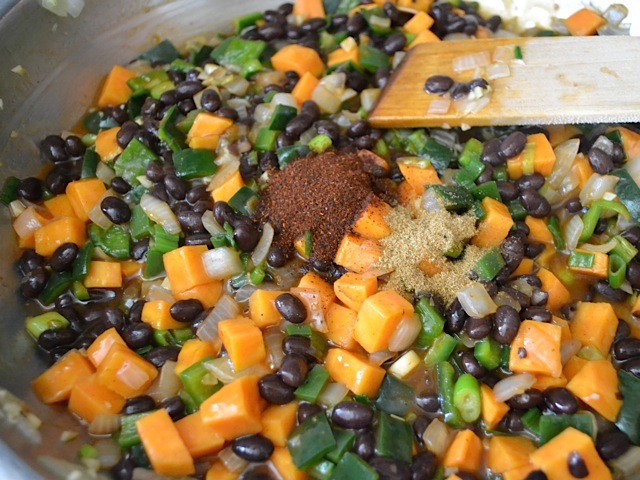 Stir these ingredients into the dry ingredients just until everything has become wet and the mixture looks even. Slightly beating the egg before adding it helps make this easier. 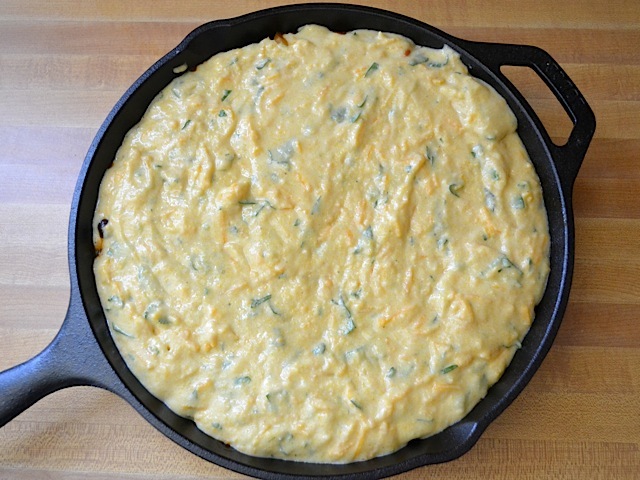 To build the tamale pie, pour the vegetable mixture into a deep pie dish, cast iron skillet, or 8×8 inch casserole dish. Next, pour the cornbread mixture over top and smooth it out evenly. Bake the pie in the preheated 425 degree oven for about 25 minutes or until the top of the cornbread is golden brown. 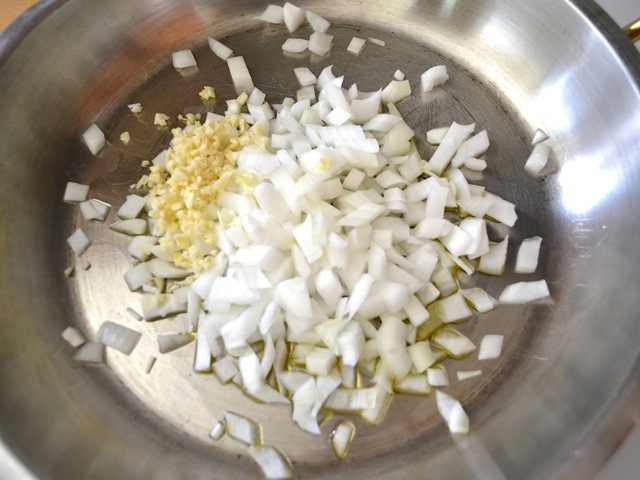 Start by cooking those onions and garlic in olive oil. While those are cooking, peel and dice your sweet potato. Add it to the skillet. For those who are unfamiliar with poblano peppers, this is what they look like. Large, dark green, and a kind of like a deflated balloon. They have a very unique flavor. If they’re not available in your area, you can substitute with other vegetables or beans to make up for the volume. Remove the seeds from the poblano and chop it up. Do the same with the jalapeno. Add both to the skillet, along with sliced green onions and black beans (drained and rinsed). I used black beans that I had cooked from dry, which is why they’re so inexpensive on the ingredient list. 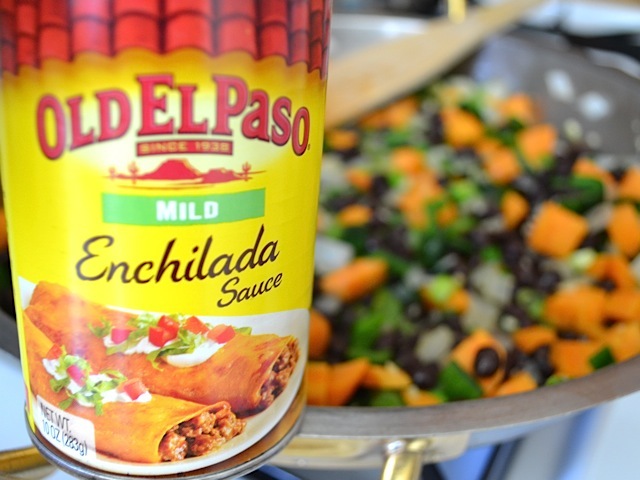 Freezing them after cooking makes them just as convenient as canned beans! Next add the enchilada sauce and then heat everything through. The enchilada sauce didn’t quite provide enough flavor for me, so I also added a little chili powder, cumin, and salt. Next it’s time to make the cornbread topping. 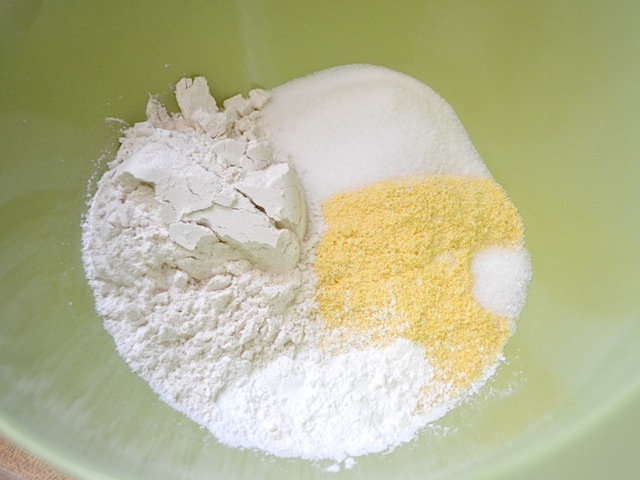 In a large bowl combine the flour, cornmeal, sugar, salt, and baking powder. Stir until they’re well combined. Oh, also begin preheating your oven at this point – 425 degrees. 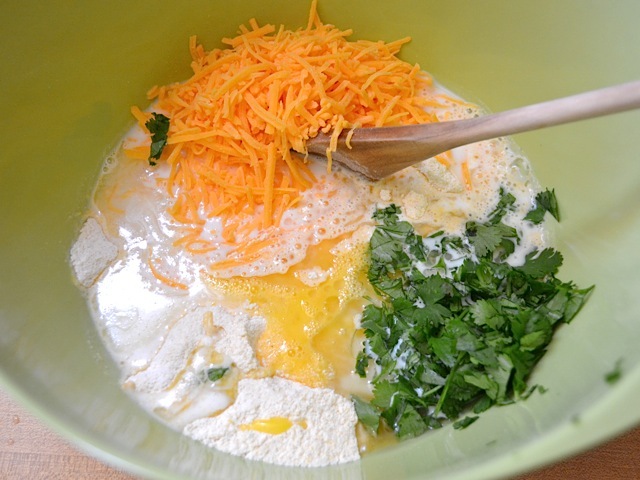 Then add the wet ingredients (milk, oil, egg, cheddar, roughly chopped cilantro). I like to slightly beat the egg before adding it because it helps it incorporate easier. The cheese and cilantro are completely optional. When stirring the wet ingredients into the dry, only stir just until all of the mixture has moistened and everything looks even (about ten stirs). You want to try to avoid over stirring. Next, pour the vegetable mixture into the bottom of your baking dish. I used my cast iron skillet because I knew it would make for some nice pictures, but you can also use a deep pie dish or an 8×8 inch casserole dish. My skillet is about 10 inches across. Pour the cornbread topping over the vegetables and smooth it out. Make sure the oven has finished preheating, and then bake for about 25 minutes or until the top is golden brown. Begin checking it at 18-20 minutes because every oven is a little different. And then it looks, smells, and tastes absolutely delicious! I cut mine into 8 pieces and had 8 very satisfying meals. I had a problem with this recipe. When it finished baking it looked perfectly done on the outside, but when I cut into it, the cornbread batter was still liquid under the surface in the center. I had the same issue when baking in an 8×8 casserole pan. I put it back in for 5 more minutes, did not help. I then lowered the oven to 375 and let it sit in the oven at 5 minute intervals until the cornbread cooked through. Next time, for this size casserole dish, I’m going to cook it at 375 for about 40 minutes. After getting it cooked through, it was very very delicious!! Very tasty! However, I found there was too much cornbread to everything else. But that’s just my preference. Does the jalapeño in this make it pretty spicy? Not extremely spicy, in my opinion, but spiciness is extremely subjective, so I’m not sure how you might feel about it. Have made several of your recipes–thanks so much! I love that you have the cost-per-serving figured out… My husband was out of work for nearly 2 years–during the birth of our first child, no less–so I learned to get REALLY creative while not sacrificing nutrition (was pregnant and then exclusively breastfeeding). Your website was my go-to place for inspiration and recipes! 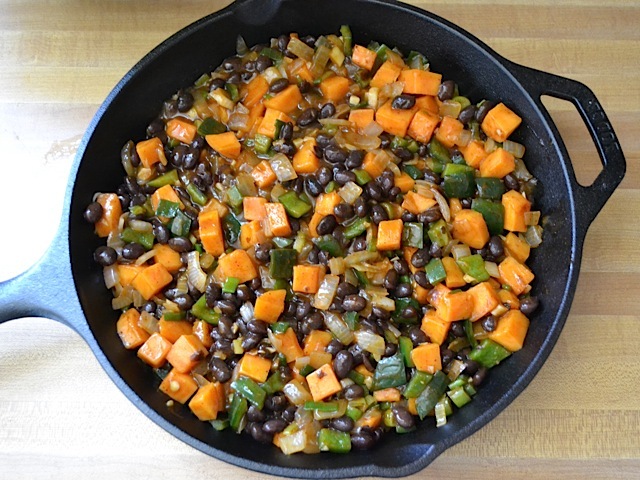 Made this for the family because it was easy to adjust for my toddler’s limited chewing ability–I just mashed the sweet potato instead of sauteing it and mixed it together with the beans (also smashed). A dinner everyone in our family can enjoy is a huge blessing to this Mama! Thanks for chipoltes in adobo sauce. Made us love it more! We used frozen, canned and fresh veggies. We like it better with butternut squash but sweet potatoes are fine. Don’t like skipping fresh peppers because I miss the flavor! 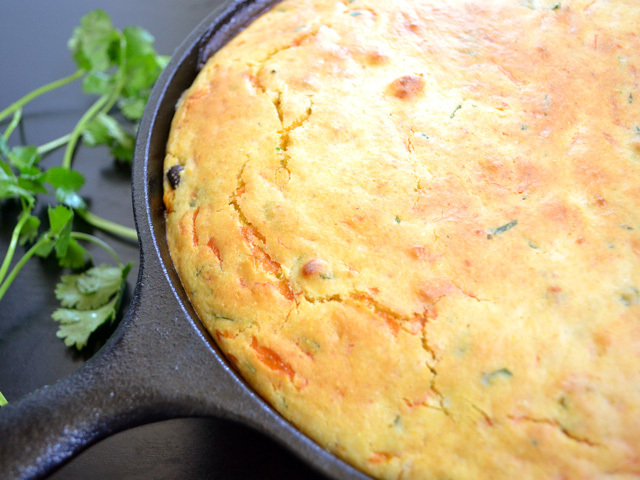 What size cast iron pan did you use? I’m looking to buy one soon and trying to decide on the size. This was a hit in my household which says a lot, since my husband loves meat. He asked me to make it again but to try it with butternut squash. I used my own, homemade enchilada sauce instead of canned. Thanks for this great recipe! Following the cornbread vs. vegetable ratio comments I used two sweet potatoes instead of one, added a 14oz. bag of southwestern vegetables and threw in a diced red bell pepper as well as everything listed in the recipe. End result was pretty good and not overly saucy or spicey, though it was (strangely) a little sweet. Okay, addendum. This was pretty good the first night but by night two the ingredients had mellowed and gotten happy with each other and it was sooo much better. Making this again soon! Big hit at my house!!! Everyone (including kids) asked for seconds!!! It has always been hard to get my family to eat vegetarian meals (I’ve been a vegetarian for years now… Kids & hubby are not…unless I cook, lol) Thanks Beth for another hit recipe at my house!!! Fab u lous! This recipe was out of the ballpark for me. I didn’t use any of the cayenne or jalapeno pepper because I am a pansy. I used half the problano. I made your red enchilada sauce. I never new vegetarian could be this good! Thank you ma’am! I think this is the first recipe I’ve made of yours, but I’ve been following a while. Husband and daughter loved it, but I will be adding more veggies next time. Thanks for sharing! I made this but I omitted the green onions and added two big tablespoons of chipotles in adobo sauce. It. Was. Awesome. Do you think this would freeze well? I want to take it to a friend that’s a new Mom. If I did freeze it, should I bake it first and the freeze? Or just freeze as is and include directions for baking? Thanks a lot Beth!! I think it would freeze very well. I’d bake it first, allow it to cool completely in the fridge, then divide into single portions and freeze. That way you can reheat it in the microwave. If you leave it whole you’d have to bake it to reheat and I’m not sure if the cornbread topping would over cook.